Home › Toys › Autism Supplies And Developments Picture Exchange Communication System Behavi..
Autism Supplies And Developments Picture Exchange Communication System Behavi.. Uses only high quality picture communication symbol images by Mayer-Johnson (used with permission). 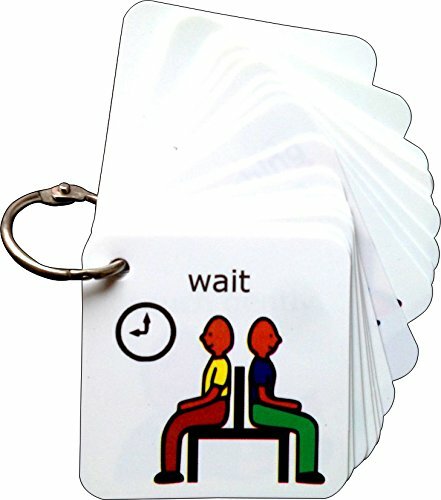 These are the most common visual symbols to be used to support the learning and development of those with learning disabilities, and therefore will be the easiest for individuals to understand and begin to implement. Made from plastic to ensure durability. All corners are rounded to reduce the likelihood of scratches. Symbols are 7cm square - large enough to see easily but small enough that they are convenient and can easily be stored in your pocket. Symbols are held together on a sturdy binding ring, making it easy to change the order of the symbols or just take some out with you if you only need some of them. This is a useful, pocket sized keyring, which contains some essential behaviorinstructions designed for use out and about. This is especially important whentrying to manage an individual's behavior, and to help them modify their ownbehavior to what is socially acceptable. it includes 21 both positive andnegative behavior symbols. It also includes a blank card at the back, for yourown design or for storing reward tokens (not included). This product, like allour products, was inspired by some of the difficulties we have gone through inraising our own autistic son over the years, and includes a lot of strategiesthat have helped him to cope with some of the challenges life can bring.